Sir Lawrence Alma-Tadema, a master of both mythological and historical painting, a passionate archaeologist. Alma-Tadema was born on January 8, 1836 in the town of Dronriypt, Friesland, in the Netherlands. Painting talented artist Alma-Tadema Lawrence was so popular that in 1882 he received the title of full academician of the famous Royal Academy of Arts, and in 1899 he was given the knighthood. Salon-decorative paintings, which succeeded Alma-Tadema Lawrence, enjoyed great success during the life of the artist, but after the death of the great master in 1912, his paintings were all forgotten, and his name remained unknown for several decades. Only in the 1960s, his talent was again appreciated, and the paintings were recognized as an invaluable asset of world culture. In 1865 he painted the painting “Gallo-Roman girls”, which depicts ancient women in Roman clothes. Here, again, there is so loved by the artist marble, which is transmitted on the canvas, he was an unbeatable master. Figures of women are written out so realistically and carefully that they seem alive. Perhaps we are seeing an intimate scene and the heroines are fascinated by the examination of some man who is not indifferent to them. 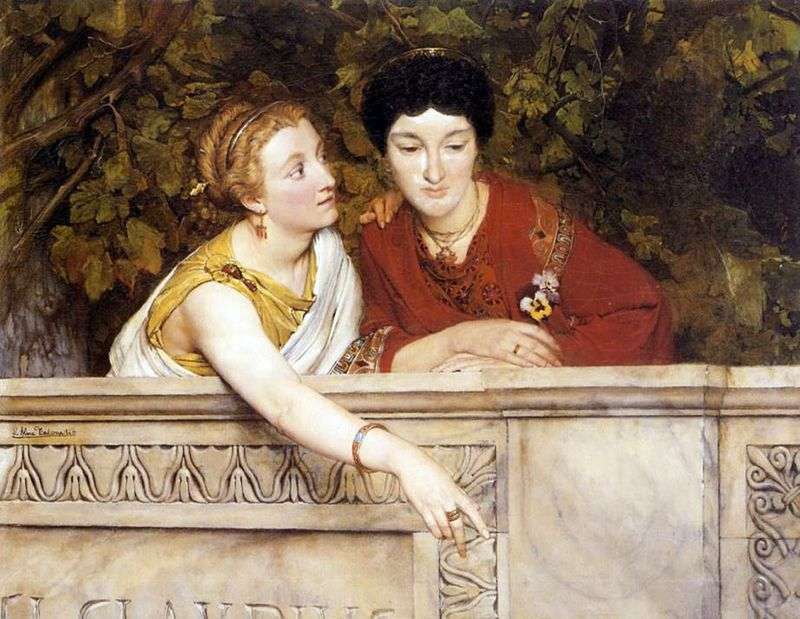 Description and meaning of the painting Gallo-Roman women by Lawrence Alma-Tadema.